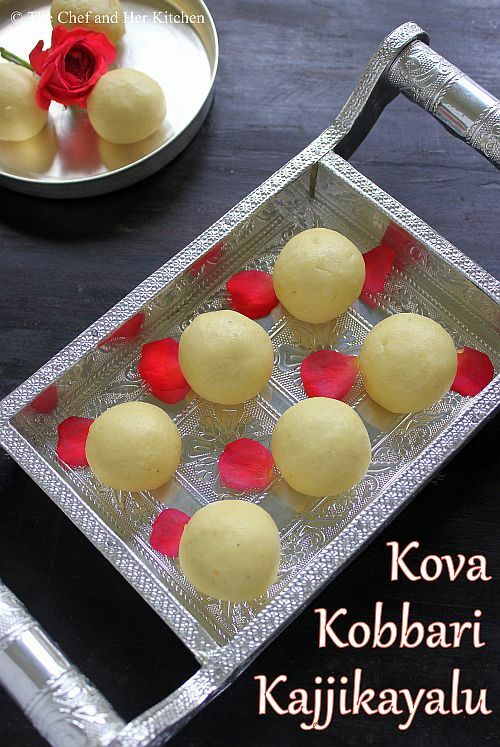 'Kova Kobbari Kajjikayalu' is also known as 'Kova laddu' is a typical Andhra sweet.It is nothing but a stuffed ladoo where the outer portion is made up of khoya and is filled with sweetened coconut mixture.There is one more sweet with the similar name 'Khova Karjikayalu' , in which sweetened mawa mixture is stuffed in a maida roti and shaped like a gujiya and is deep fried and then it is soaked in sugar syrup. 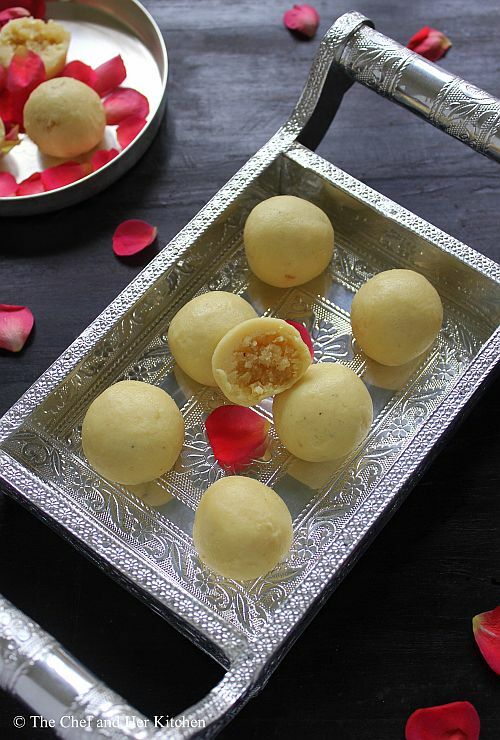 The preparation process for both these varieties is entirely different and hence don't get confused with the name and hence in this post I call this sweet as Kova Laddu to avoid further confusion. 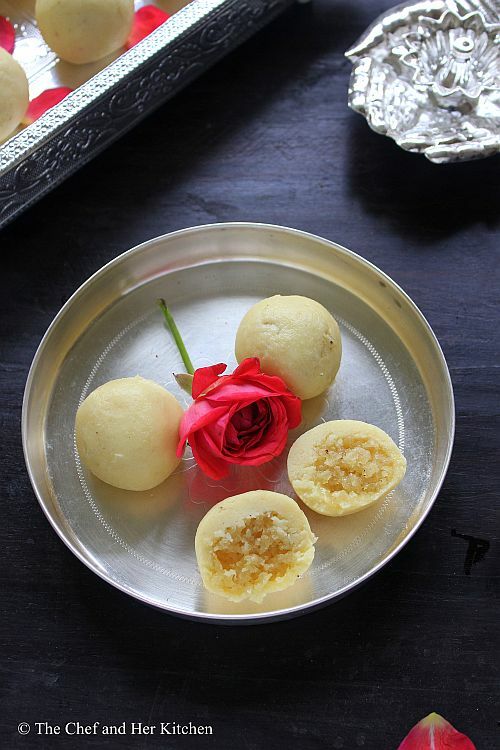 During my last visit to Bangalore we had got lot of khoya from my mom's native place and hence got to prepare various varieties like Khoya Jamun, Kova kobbari laddu, Kesar Peda and various halwa varieties.So stay tuned to check out various sweets recipes in my blog this Diwali. 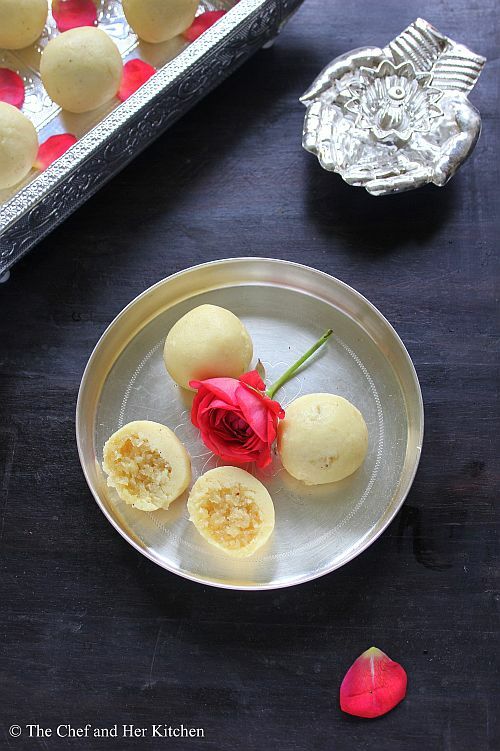 The preparation process of Khova ladoo is very simple but it tastes very delicious.How can it go wrong with all the ingredients like khoya, coconut, sweeteners like sugar and jaggery in a sweet? 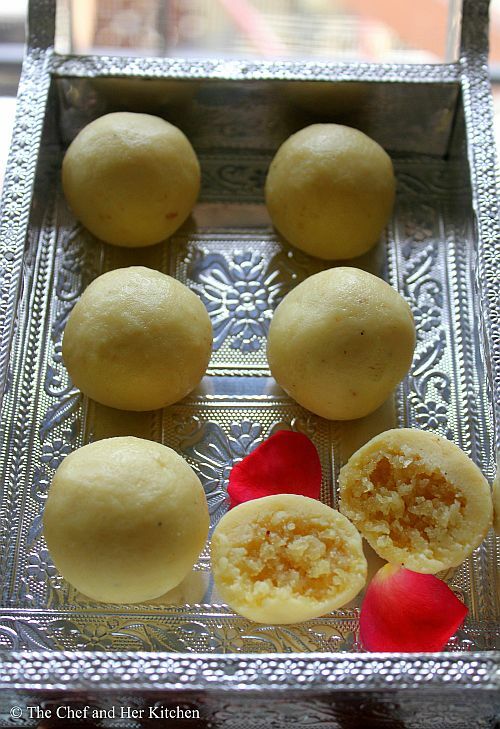 I had prepared this sweet during night and hence the step wise pictures did not come out well because of poor lighting but still gives a fair idea of the preparation process. Take a heavy kadai and mix grated coconut with jaggery and keep over medium flame stirring constantly till it forms a thick mass. Add cardamom powder to it at the end and mix well. Remove it from fire and let it cool.When it is still warm prepare 10-12 small balls out of the mixture and arrange on a broad plate.Leave them aside to set properly. Add crumbled koa to the pan and heat it until the khova softens. Add powdered sugar to it and stir constantly till it bubbles and leaves the edges. Remove from fire and stir it vigorously using a wooden masher to get a soft thick mass.Pour the mixture on to a plate and let it cool. When the mixture is still warm knead it to a soft dough and make even sized balls which are slightly bigger in size than the coconut balls. 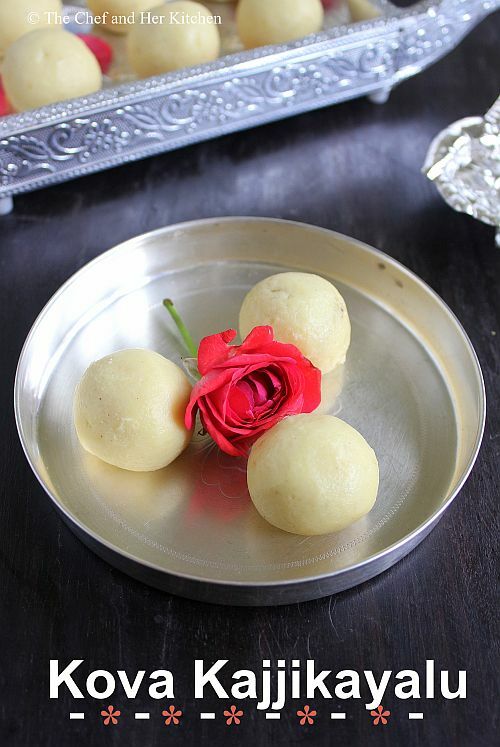 Flatten the khoya ball on your palm and place the coconut ball inside and gather the edges of the khoya together and roll it to a smooth ball. 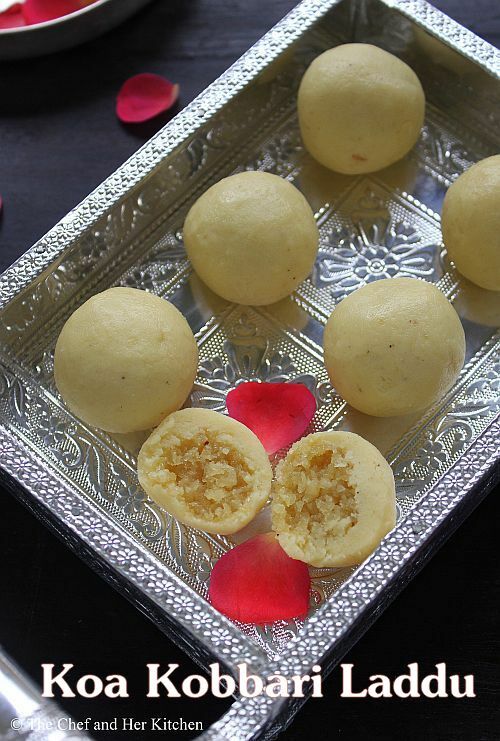 Repeat the process with the remaining balls and prepare all the stuffed ladoos. Arrange them on a wide plate and leave them to set. Start preparing the ladoos when the khova mixture is warm. If the mixture cools it will become hard, if it becomes hard place the mixture over the flame and stir for a minute or two to make it soft and proceed again. This was just right in sweetness for us, if you want it sweeter increase 2-3 tbsp of sugar and jaggery to suit your taste buds. You can add few saffron strands to the khoya mixture while it is bubbling. This looks so yummy and easy. And since it has no butter fat or ghee, low calorie!! I can't get khoya here in Japan, could I use lots of powdered milk to make it, I wonder? ?